An economic impact of 134.7 million Euros was reached in 2018, which led to the creation of 2,754 jobs and a tax revenue of 16.8 million Euros. A total of 33 trade fairs, 146 events at BEC Conventions, and 27 shows at Bizkaia Arena are behind these figures, in which over 1 million visitors took part. The Basque entity tops off a year of consolidated growth in terms of international projection and activity, considered as “excellent” for the venue and its metropolitan area. 134,657,261 Euros. This is the measure of economic impact in terms of the Gross Domestic Product that the Bilbao Exhibition Centre generated in 2018, the highest figure recorded since the venue was commissioned in 2004, and with which it accumulates a total of 1,236 million Euros since then. After twelve months of intense activity, during which 206 events were celebrated, the space was occupied for 278 days, and 1,082,203 visitors attended, the Basque entity has closed an “excellent” year of consolidated growth in international projection and activity. The impact of the BEC in the Basque Country over the past year has provided figures such as 16,827,959 Euros of tax revenue for the Basque tax agency and the creation of 2,754 jobs. In qualitative terms, it has generated new services and value proposals related to strategic sectors in both professional and leisurely meeting points. These results reaffirm the BEC as a key piece of infrastructure for trade fairs, congresses, conventions, and shows, and therefore a first order economic driver which invigorates the business, associative, institutional and social fabric of the surrounding area. Numerous and diverse events have taken place at BEC since last January: some internationally recognised brands in the sector such as BIEMH-International Machine-Tool Biennial Exhibition, Routes and Rail Live; others with a global impact for the general public such as the MTV Awards; pioneering trade shows that are references in the field of advanced manufacturing technology such as Addit3d and BeDIGITAL; consolidated events like Egurtek, PIN-UGP, Tendencias Creativas, Workinn, Retroclásica and Biocultura, Public Sector Job examinations; and concerts with Shakira, Fito&Fitipaldis, Ara Malikian, and many more. 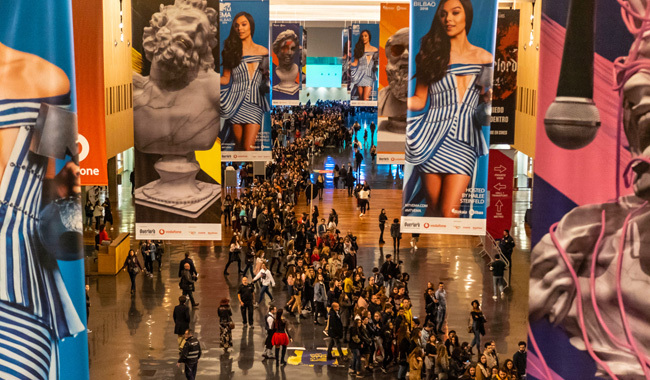 A total of 206 events took place, divided between 33 trade fairs involving 3,130 exhibitors, 146 events at BEC Conventions, and 27 shows at the Bizkaia Arena. These figures are the result of what have been true milestones given the complexity and significance of the events, and sum up a “great year” for the BEC and for the Basque Country as a whole, stimulating its international projection and positioning as a reference destination. Finally, the generation of greater activity, more resources, and better results in 2018 confirms that the 2017-2020 Strategic Plan that the BEC is currently working towards is on the right track. The main lines of action are reinforcing the entity as an ally for companies, institutions and the Basque society, and as a differential space for priority and emerging sectors, following a proactive business model with a vocation for innovation and digital transformation, and maximising the use of non-exhibition areas. The Plan provides a clearly expansionary approach focussed on growth in both the national and international markets, and on the continuous evolution of the portfolio of products and formats. BEC faces its 15th anniversary with optimism, in a year filled with new challenges based on the favourable economic context and the solid foundations of last year’s results. The venue is preparing to host new international events of the highest level, including shows in the architecture, wind power and rail transport sectors such as: [email protected], Rail Live and Wind Europe Congress & Exhibition. The +Industry platform stands out in regular programme, which is the name given to the seven events that will convert the BEC into the largest meeting point for the industry from 4 to 6 June. Under the slogan “More exhibitions, a better industry”, the synergies and strengths of the events will be on display, featuring ADDIT3D, the International Trade Show on Additive and 3D Manufacturing; FITMAQ, the International Fair of Bargain & Used Machinery; IT by FERROFORMA, the International Industry Tools and Supplies Fair; MAINTENANCE, the International Industrial Maintenance Fair; PUMPS & VALVES, the International Trade Show for Pump Systems, Valves and Equipment for Industrial Processes; and SUBCONTRATACIÓN, the International Fair of Manufacturing Processes and Equipment. Finally, the Bilbao Exhibition Centre will celebrate its 15th anniversary in April. BEC! is working on a commemorative event for its anniversary which will be attended by the main actors for all that takes place at this institution.